High performance applications such as steam, chill water, water, utility lines, gasoline, natural gas, air, oil, jet fuels and process lines. Heavy duty circular key holds the seat and retaining ring in place, providing bidirectional, dead-end service at full-rated pressure. This eliminates the need for easily corroded and hard-to-remove retention screws. Uninterrupted gasket surfaces eliminate problems associated with seat retaining screws in the gasket surface and allows use of standard spiral wound gaskets. 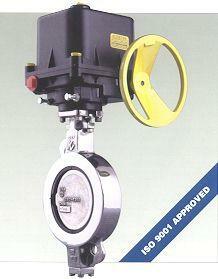 Laylength conforms to MSS-SP-68 and can be configured to ISO 5752 short for PN25 pressure rating. Unique interference seat design with energized elastomer 0-ring allows Class VI shutoff at lower pressures. The seat is further energized by line pressure, providing the same tight shutoff at full-rated pressure. Valve stem, designed to API 609 standards, protects against blow out. Adjustable packing utilizes unique rocker-shaped gland bridge that compensates for uneven adjustment of gland nuts. Optional non- adjustable packing offers an economical alternative. Extended neck allows for two inches of clearance for insulation. Seat retaining ring is housed within the flange gasket I.D. to eliminate potential emission path. Variety of material trims allows use in various specific applications and services.